Australia is one of the world’s more heavily urbanised populations, so it’s incongruous that this nation of city slickers ignores cars with the smallest footprints. Yet we do. Well, not entirely. The Kia Picanto has rightly been credited with revitalising the so-called ‘micro car’ segment, as its 69 per cent market share shows. The company has just expanded the range by adding the chunkier, slightly raised Picanto X-Line derivative, in kitschy ‘AO Edition’ (Australian Open, reflecting its tennis sponsorship) guise. 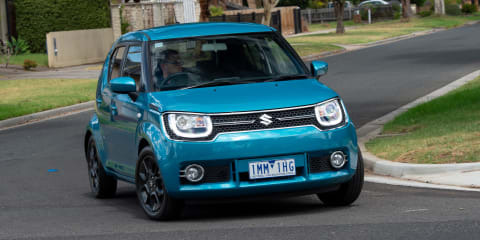 This pocket-sized offering lines up neatly against a car marketed somewhat absurdly as a miniaturised SUV, the Suzuki Ignis – a car that would look more at home in Tokyo than Tamarama, Toorak or Taringa. This twin-test aims to compare and contrast these two tiny terriers in their natural urban jungle habitat, and to find out if they make sense in the first place. 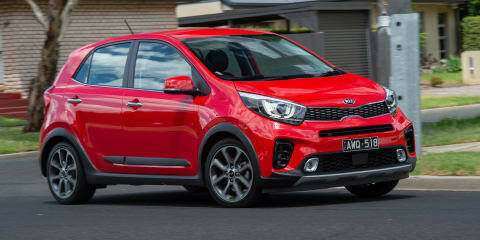 The Picanto range kicks off at a suitably small $14,490 drive-away, though the AO Edition with extra stuff wears a drive-away price of $17,990. The Ignis GL base model kicks off at $16,990 drive-away, but the GLX model driven here costs $18,990 instead. So at face value there’s $1000 in it. As ever, shop around. These price points mean they aren’t under-cutting base versions of bigger cars like the Hyundai Accent and Mazda 2, but they bring to the table decent equipment lists and cool designs. Both the Picanto X-Line AO Edition and Ignis GLX have six airbags, reversing cameras, cruise control and speed-limiters, all-round electric windows, air-conditioning, Bluetooth/USB, 7.0-inch touchscreens with Apple CarPlay and Android Auto phone mirroring, dusk-sensing headlights, 16-inch alloy wheels and LED daytime running lights. Not bad. There are some crucial areas of difference. The Kia is the only car here with city autonomous emergency braking (AEB) and forward alert, which is becoming a must-have. It also gets faux leather seats. On the flipside, the Ignis GLX alone gets a proximity key, push-button start (meaning no key-in-barrel), satellite navigation, digital climate control air-con and LED headlights rather than weaker halogens. The fact the Kia is a smidgen cheaper and has AEB (which brakes the car automatically if you aren’t paying attention to an object in your path) is compelling. Having sat-nav in the Suzuki is nice, but the phone-mirroring apps give you online maps on the centre screens already, remember. Kudos to both, really. Let’s call it a tie and move on. Both of these cars sit a little higher off the ground than others in the class. The Picanto X-Line is raised by 15mm over the regular versions and has a ground clearance of 156mm. But the Ignis has even more, at 180mm. This fact, along with the high roof lines and big front windows, means both offer nice driving positions with good outward vision, though neither has telescopic steering wheel adjustment and the Suzuki’s C-pillar is huge. In other dimensions, the 3.7m-long Suzuki has 40mm on the Kia, and is similarly 35mm wider at 1660mm. The Suzuki is also 95mm taller (1595mm) and 35mm longer between the wheels (2435mm). The Kia has lovely clear analogue dials, a slick leather-trimmed steering wheel with buttons for the audio and cruise-control functions, and nice touches like red highlights on the easy-to-clean fake leather seats, plus sporty aluminium pedals. There are good storage options too, from a small centre console, generous door bins, a two-tiered open area under the fascia, two cup holders and a glovebox. To Suzuki’s credit, the Ignis is every bit as practical in this regard. The centre screen is of high quality, and it shares its software with much more expensive Kias. The presence of CarPlay/Android Auto is essential, and the clarity of the reversing camera is better than many cars twice the price. It also has dynamic guidelines. While most of the plastics used are hard to the touch, they feel of a higher grade than the the Suzuki’s, which both looks and feels its price more than the Korean contender does. The Picanto’s build quality is indeed very tough to fault, being every bit as good as the Cerato. The Ignis’s plastic trims are comparatively budget-like, though Suzuki makes up for this with its reputation for bulletproof reliability. It also looks far more adventurous and cool, with touches like the white inserts/faux carbon-fibre vent surrounds, and the chunky little climate-control set-up below the touchscreen. Like the Kia, it has Apple CarPlay/Android Auto, and a good reversing camera. Tick for tech. One thing we’d point out is that neither has a digital speedo. Where I live (Melbourne), the legislators fine you a huge sum for going a meagre 3km/h over the speed limit, so sometimes analogue set-ups don’t cut it. Just some feedback. While most owners of these cars will usually drive one- or two-up, both have surprisingly useable back seats for two regular-sized adults, each with two ISOFIX-enabled child-seat anchors points, rear side airbags and electric back windows. The Kia is technically a five-seater, whereas the Suzuki is honest and only has four pews and belts. On the downside, the seat bases in the Ignis are ridiculously short, meaning if you’re an adult you’ll get precious little support. The Ignis’s party-trick back row seats also slide forward and recline, with the former a useful way to expand the boot floor surface area. In both cars, the back seats also fold down, though the Kia’s fold flatter and lower. In terms of boots, the Kia carries 255L with all seats in use extending to 1010L with the back row folded. The Suzuki varies between 264–1104L, and is more flexible as per the last paragraph. Both have space-saver spare wheels under the floor. The Kia’s interior is more refined and feels a little more premium, though the Suzuki is a touch more adventurous and practical. The word ‘gutless’ is mean, and are we really going to say such things to two cars this adorable? Yes. Because they both are. However, they’re also designed overwhelmingly for city driving, dashing around at lower speeds, poking into gaps and sitting in gridlock. So, we’ll let that slide. They both have 1.2-litre four-cylinder petrol engines. The Kia’s makes 62kW of power and 122Nm of torque compared to the Suzuki’s 66kW/120Nm. The Kia weighs a neat 999kg, but the Suzuki is an even more exiguous 865kg. So its power-to-weight ratio is superior. The Kia uses a cheap (but archaic) four-speed automatic gearbox, whereas the Suzuki has a CVT (a ratio-less continuously variable transmission that constantly adjusts to the engine’s speed). Europeans may buy manual gearboxes en masse, but Australians overwhelmingly like self-shifting units. The Picanto’s engine is a little quieter and more refined, and is happy enough in urban surrounds. But under heavy throttle it becomes harsh and thrashy, while at 110km/h the lack of a taller fifth/sixth gear means the engine will be spinning above 3000rpm, hurting noise suppression and fuel use. Punching into gaps is fine, given the initial pick-up, but then you hit a proverbial wall and the progress isn’t exactly going to pin you in your seat. Of course, this might be music to the ears of parents to L-platers! The Suzuki’s engine refinement is poor, with more vibrations and noise entering the cabin. However, the CVT (often a bugbear) is well suited to wringing the most out of a small engine like this, and it always feels more responsive when moving, and is more relaxed at highway speeds. In terms of fuel use, the Suzuki claims 4.9 litres of regular fuel per 100km; a claim we were able to match on our unmixed drive loop. The heavier Kia claims 5.8L/100km compared to which we averaged 6.5L/100km. Both run on the smell of an oily rag, then. Suzuki gets the nod in this area, just. Kia Australia has permission from its head office to tweak the springs and dampers for our market, meaning its cars usually strike a good dynamic balance between ride comfort and decent body control/handling. The Picanto does well at this, and its extra clearance also comes in handy (ditto the Suzuki’s). The general isolation of noise and harshness is better in the Kia, and the steering dartier and lighter. It has a whole turn less lock than the Suzuki, which is pretty unusual. It also has rear disc brakes unlike the Suzuki’s drums, which deserves credit, though keep in mind the Suzuki is so light that it doesn’t need huge stoppers! The Kia runs on Nexen tyres (195/45) compared to the Suzuki’s higher-sidewall Bridgestones (175/60). Despite this factoid, the Ignis’s front wheels crash over potholes and speed bumps more, sending sharper inputs and rattles into the seat and steering wheel compared to the Kia. Its steering is also slacker, and the NVH suppression inferior. The dampers could use some tweaking, to be honest. Interestingly, both felt stable and planted at 110km/h, though obviously it’s not their happiest way to be. Safety-wise, the Picanto gets a four-star ANCAP crash score (2017). ANCAP’s European sister Euro NCAP gave the Ignis a mixed score of three stars for ones sold without AEB, and five stars for those optioned with this tech (2016). In Australia, we don’t have the option. That’s disappointing from Suzuki. The all-important Adult Occupant crash scores, meaning the actual impact protection of the body structure, crumple zones and airbags, were 87 per cent for the Suzuki and Kia alike. So that’s some reassurance. We’re giving the Picanto the edge here. Kia has an equal market-leading seven-year warranty with no distance limit, ensuring good resale values and peace of mind. You also get roadside assistance and a capped-price servicing plan, the latter at intervals of 12 months or 15,000km (whichever comes first) priced per visit at $248, $429, $302, $470 and $280. Suzuki’s base warranty is three years/100,000km, but if you service your car at one of its dealerships this expands to five years. Dealerships make most of their profits by servicing rather than selling cars, so the rationale is clear. We recommend using dealer servicing on new cars for a period of at least five years. The Ignis’s servicing intervals are only six months/10,000km, so you need to go back twice a year rather than potentially once like the Kia. The first five visits cost, respectively, $175, $175, $175, $429 and $175. As a disclaimer, all car companies reserve the right to change their capped-price service costs due to CPI or parts-cost increases, but they must legally state as much on their servicing pages, which are simple to find. It’s hard to ignore that Kia warranty, and the service intervals. Tick. What a cute pair this is. Not everybody should desire a big car, especially if a tiny turning radius, decent ride height and dirt-cheap running costs are key factors. Not to mention having a modicum of style. This pair is hard to split on paper, and equally tough to split in person. The Suzuki has a slightly more engaging engine/gearbox, a niftier interior and exterior design, and a longer list of features. Whereas the Kia is a little more sophisticated, more agile and comfortable to drive, and has a superior warranty/service intervals. My heart says Ignis but the head says Kia. It’s narrowly superior.